Cheers to pretzels, sausage, sauerkraut and cheese…Pour a good German beer and dig in! Grill the Hoffy Smoked sausages until charred and heated through. Slice the sausages into bite-sized pieces. To assemble the nachos, line a large platter with the pretzel crisps. 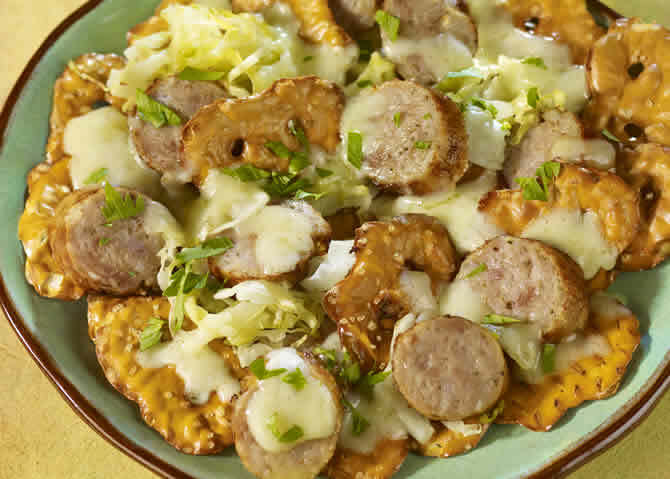 Top with the sausage pieces, scatter sauerkraut over top and finish with the shredded cheese. Microwave the platter until the cheese is melted and bubbly. Garnish with parsley and serve.